A few months ago I was contacted by the folks over at Stitchcraft Marketing to see if I would be interested in knitting something out of Mountain Meadow Wool. Mountain Meadow is a spinning mill set below the Big Horn Mountains on the Western Plains of Wyoming. It is a family operated mill, owned by Karen Hostetler, and dedicated to supporting local ranchers and raising awareness about ranching culture in the American West. Mountain Meadow is committed to revitalizing the American wool industry through eco-friendly operations and fair prices for ranchers. One of the yarns that Mountain Meadow Wool was offering for review was its Alpine base. 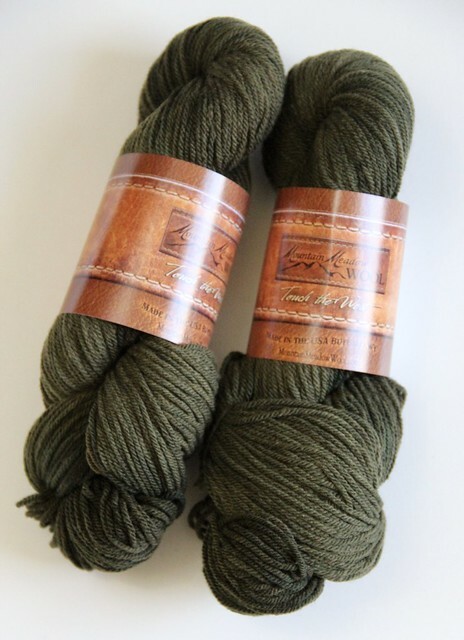 Alpine is a DK weight 3-ply worsted spun yarn that is 100% Targhee merino and comes in 260 yard/100g skeins. When I had the opportunity to try out this yarn, Mountain Meadow Wool generously offered 2 skeins, and I eagerly selected the Moss Colorway. I decided before the yarn arrived that I wanted to design something with this beautiful yarn. 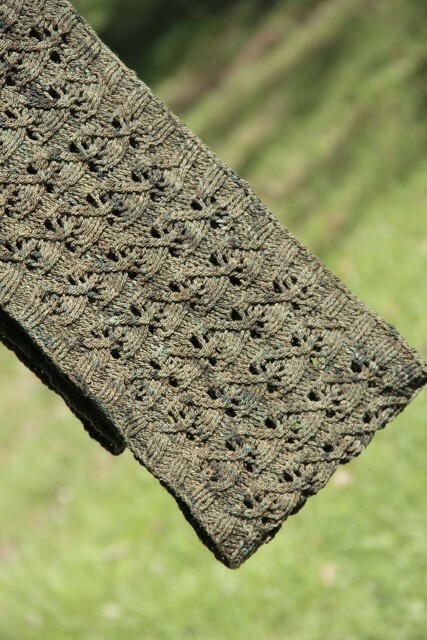 Around the same time Frenchie of Aroha Knits did an Initiate Knit Design challenge. 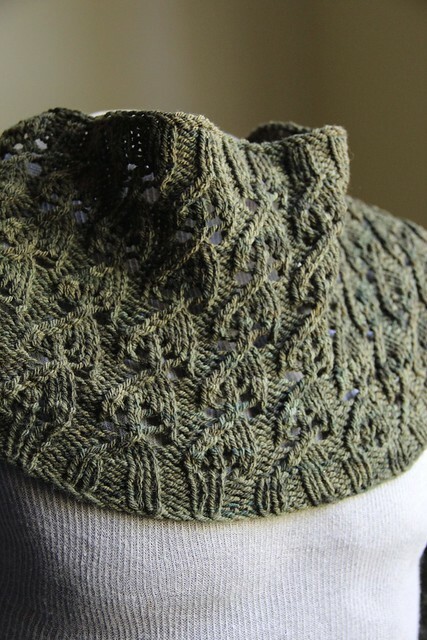 I spent lots of time swatching and planning, and ultimately I knit an eternity loop with a leaf pattern. The yarn was really a pleasure to work with. I expected the Alpine to be a little rustic, but I was pleasantly surprised when it was so very soft. It was wooly, but was also super soft and almost cottony in feel. Once washed, it bloomed and developed a really nice drape. It stood up to some swatching and ripping and never showed any wear. I would definitely consider this yarn again; I’m thinking I could use a sweater in it! I finished knitting my sample last week, and this week the pattern, Wood Sorrel, is being tech edited and is then off to testers. I hope to release it in mid-May. 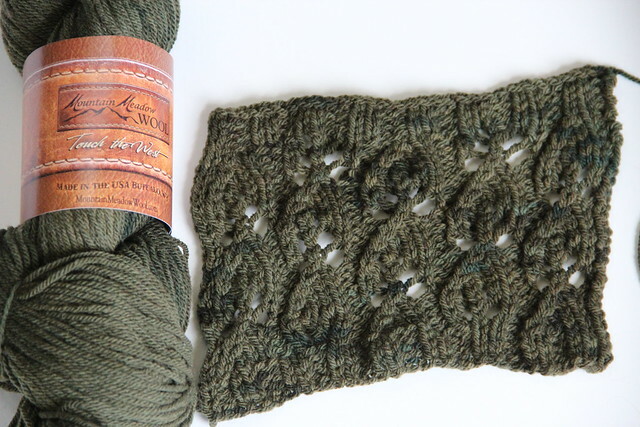 Wood Sorrel will be available on Ravelry shortly. A special thank you to Stitchcraft Marketing and the folks at Mountain Meadow Wool who sent me the yarn (retail: $46.00) for free. I received no other compensation for this review. All opinions and photos are my own. Previous The Corner of Knit & Tea: Episode 134, Wood Sorrel. Next The Corner of Knit & Tea: Episode 135, Ply Away!